Are you looking for revision-proof archiving software for your company, an archiving system where you can find everything quickly and easily and that you can use anytime and anywhere? Then your search is over, because you have found what you’re looking for. EASY Archive Smart is the lean archive from EASY. It can be set up in only a few steps with the help of an interactive assistant. The archiving system is largely preconfigured, reducing the installation and administration effort. 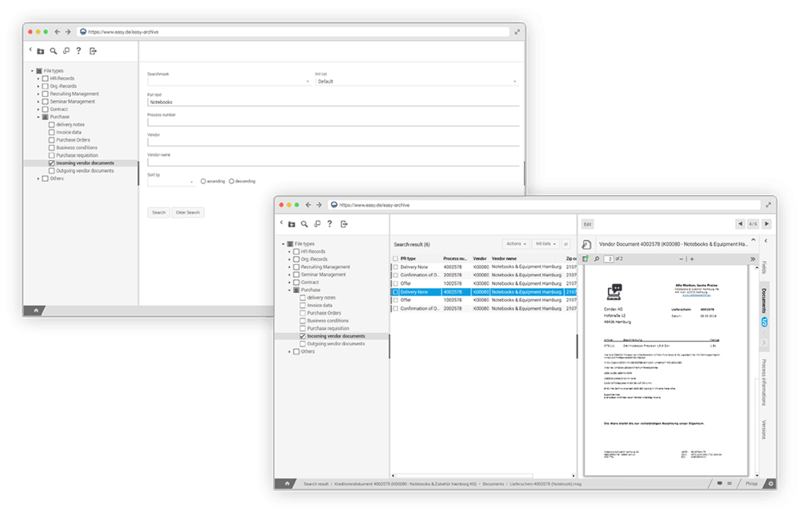 You also no longer need to license, set up and manage databases on external servers: EASY Archive Smart has an integrated, maintenance-free database. The solution is as lean as it is impressive in terms of performance, reliability and flexibility. A wide variety of functions and interfaces are available as plug-ins. That way, the installation is oriented on the customer’s needs. The core of the archiving software remains lean and high performing. Expansions with additional interfaces or function modules, such as a web service for the administrator or an SAP connection, can even be added during operation. Last but not least, EASY Archive Smart fits in your Cloud scenario. For document archiving in the Cloud as easy as a service. No matter if you’re archiving electronic invoices or use the archiving software to archive personnel files, delivery notes or mail, the compliance requirements for archiving systems are high, because they must meet national and international regulations and standards for long-term, revision-proof archiving. With EASY Archive Smart, you have a powerful complete solution which meets international standards. These data must be provided in a form that can be analyzed, that is machine-readable. Web-based standard interface: Facilitates the quick and intuitive access to information and documents as well as the processing of tasks in ongoing business processes. Responsive design: For seamless use on all mobile, web-capable devices. Layout and ergonomics automatically adapt to the device’s screen, allowing optimum operation. Search function: A full-text-based quick search is included, as is an advanced search with additional search parameters, such as information type, field properties, date range and much more. All located information is presented clearly by the client. The document can be accessed immediately. Customization: The appearance and structure of the user interface can be adapted to the individual requirements, the processes presented and last but not least the desires and corporate identity (CI) of the customer. Integrations: Thanks to the open system architecture and standard interfaces, EASY Archive Smart integrates quickly and easily in the system landscape.